Old Town Apartment is located in the historical area of Niccolò which is famous for its traditional restaurants and craft shops. Just in the centre of Florence, it is a stones throw from the Ponte Vecchio and just below Forte di Belvedere and Piazzale Michelangelo. After crossing the River Arno you are minutes away from the historical sites of Florence, the Uffizi Gallery, Piazza della Signoria and Palazzo Vecchio, Brunelleschi's Dome and Giotto's bell tower, the Basilica of Santa Croce, the Accademia Gallery (with the celebrated Michelangelo’s David). Old Town Apartment is located in Via San Niccolò, 76 about 7km away from the airport of Florence, arriving in town we suggest you take a taxi since you don't know the city and you will have to carry bags with you. You will be here in 25/30 minutes and the flat rate for the taxi will be Euro 20.00 + 1 Euro per piece of bag. 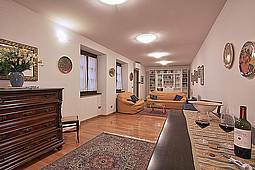 Old Town Apartment is located in Via San Niccolò, 76 around 2km away from the main station of Florence (S.M.N. ), arriving in town we suggest you take a taxi since you don't know the city and you will have to carry bags with you. You will be here in about 15 minutes and the rate for the taxi will be around Euro 15.00. Please note that driving and parking in Florence is reserved for residents. However, you may drive to Florence Old Town Apartment just to 'unload' your luggage. In general we recommend that you to drive directly to the garage and then walk to Florence Old Town Apartment (approximately 750 meters). -Follow our detailed instructions to Florence Old Town Apartment. -Keep driving entering Lungarno Cellini and pass the first telematic access point that controls access of the city center. You may pass through this access point. -Lungarno Cellini becomes Lungarno Serristori. Continue until you have Piazza Demidoff on your left hand side. -Turn right again and you will be in Via San Niccolò. -Drive straight along the river on Lungarno Torrigiani that become Via de' Bardi. In order to better manage the urban traffic, telematic gates have been activated in the City Limited Traffic Zones (ZTL). As of 1st December 2011, the city has introduced a new toll for entering the city's center by car. The garage will input your license plate details into their computer system, this toll is included in the rate of the garage. For those guests returning a car to a rental company without using the garage services, please provide the car’s plate details at Florence Old Town Apartment at check-in. You will be required to pay the toll at the hotel ONLY in this case. The two restricted traffic zone access points for zone A+ are NOT ACCESSIBLE for anyone under any circumstances (one is in Via dei Bardi after Garage Ponte Vecchio and the other in Pizza Pitti both on the Arno south bank). 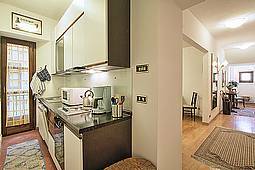 All about Old Town Apartment Florence.